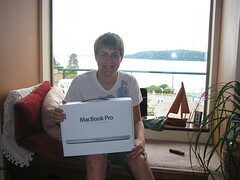 It is a Bulthuis tradition to send their sons off to college, armed with the latest Mac laptop. Ever since Bjorn received his first MacBook Pro, Calvin has been anticipating the day when he would get his own Mac laptop. Well, the day has finally arrived! We snuck past the long line of iPhone buyers today to snag a 15" unibody MacBook Pro, as well as a free iPod Touch (college student promotion) from the Apple Store in University Village. Calvin is all smiles tonight as he is probably the envy of his brothers, since every three years you can get more Mac for your parent's buck.